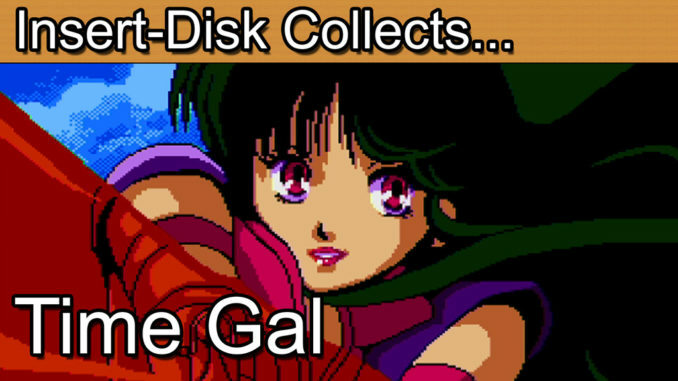 Insert Disk collects Time Gal for the Sega CD. Today’s retro game review is Time Gal (タイムギャル) for the Sega CD. 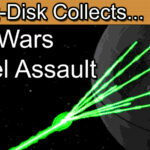 This retro gaming classic from Taito is best described as a cinematic interactive movie game. Time travel across different eras as Reika to defeat the evil Luda. 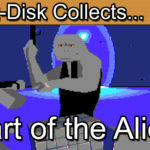 Although the laseractive version of the game is the superior of the initial home console releases this Sega CD edition of the game has plenty to offer. Greetings collectors and welcome to today’s retro game review. I’m rather excited about today’s episode as we get a bit of everything. A Japanese animated classic, fast paced action, a resurrection of a hidden gem and a charming heroine to top it all off. Despite all of this the game remains relatively unknown in western culture. Join me today as we step back in time to experience the joys of Time Gal. As you may have guessed from the introduction, Time Gal is best described as an interactive movie. I’m looking here at the 1992 Sega CD edition but the game has its Japanese arcade origins right back in 1985. 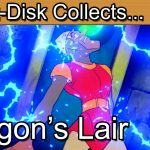 The game used laserdisc technology similar to that of 1983’s Dragon’s Lair to create the distinctive animated feel to the game. The plot of the game is easy enough to follow as there is minimal dialogue and plenty of action. Our heroine Reika, time travels throughout history in order to track down the criminal known as Luda. Reikas mission is to stop Luda’s abominable plans to change history. To do this you’ll guide Reika as far back as 70,000,000 BC right through to 4001 AD. All in all, that’s quite a lot of scope for a plot. As with most interactive movie games the control system is very basic. The movie will play out as an action sequence, as the action progresses you will need to either press up, down, left, right or the action button to guide yourself to safety. Fail to react in time and you’ll be killed in a humorous cut scene. Time Gal does offer up a rather quirky variation on the theme. Periodically Reika can stop time in order for you to select one of three options as in this sequence. Pick wrong and you’ll lose a life. Pick the correct option and you’ll continue on your journey. It’s worth remembering that its arcade origins have a lot of influence here. If you’ve never seen the level it’s a straight 1 in 3 chance of success. You can only imagine the amount of Yen that this mechanic must have single handedly made Taito. It’s time for me to come clean, for the rest of this episode I’ll be showing the full play through but with a little help from a menu feature. As well as being able to adjust the lives and difficulty you can access a video mode. Simply enter the password and watch each stage play out. There are 16 stages in all, each with their own distinctive theme. Most levels will take under a minute to complete if you know what you’re doing but there is a good deal of preparation needed to get to this level of memorisation. Overall the video is reasonably crisp and the audio is also quite decent for a Sega CD game. Reika herself is a really likable character. She’s got that gutsy edge to her that she’s up for the fight but also has some great one liners and a positive attitude. There’s a vulnerable edge to her in some scenes but you’ll know that she will battle through. Whilst the title “Time Gal” can almost sounds a little patronising to Western ears, when you get down to it there’s a very solid character here. She really is a standout heroine and it’s a shame that she never became a household name. As gamers we often hear that there are few strong female leads in retro games. It’s clear that there are, it’s just that most don’t know about them. Reika is not damsel in distress like Paula, Peach or Zelda were back in the early 80’s. Reika’s first appearance predates Samus Aran in a time before strong females took the main stage in gaming. So, you’re probably wondering a bit more about Reika and why you haven’t heard of her. The chances are that unless you are in to Japanese gaming you may not know the character as she’s not exactly a household name in Europe or the Americas. However, you may have stumbled across her if you are in to collecting Japanese games new and old. You can find her in Elevator Action Deluxe as an additional character but you’re most likely to know her from the shoot ’em up Castle of Shikigami III. Since her 1985 debut, Reika Kirishima never really went away she’s just been doing her own thing. 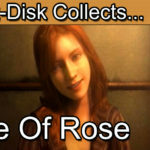 She would certainly be in my nominations for most overlooked female gaming protagonists of all time. The Sega CD version of Time Gal is sadly not as detailed as the original arcade or laseractive versions. Understandably bringing this type of game to work at all was a technological hurdle to clear back in the early 90’s. In terms of pricing the Japanese arcade edition is by far the most expensive. If I’m honest I’ve only ever seen photos on the internet and they are almost never traded outside of private collections making it near impossible to value. It’s without question that if you have an original arcade edition you’d be looking for 1000’s of dollars on the open market, especially outside of Japan. Time Gal was also remastered and brought to the Laseractive, Play Station and Sega Saturn in Japan. Sadly though you’ll be looking to pay large amounts to own a copy. They do address the compression issues and frame reduction of the Sega CD edition dramatically and I’d dearly love to own an original copy if ever I win the lottery. Here though is the UK PAL Sega Mega CD Edition of the game. I’ve been collecting Sega CD games on and off since the 90’s and was please to find this one around the early 2000’s. The artwork is really solid and you will of course get the European CD double jewel case to house the disc. The artwork continues on to the manual. Inside though is a really poor effort to show off the game. Considering that the game is so dependent on visuals it would have been nice to see this reflected in the manual. For a complete edition £20 is the current entry price but sales nearer £30 are very common. In the US I’ve seen some more impressive pricing. We know that sealed editions are creeping towards $150. Complete mint editions typically sell for less. Time Gal is an interesting game for collectors. It’s rare enough to fetch some decent money but not well known enough to the masses to generate great demand. Should Time Gal ever drip back in to the wider gaming community the price of this game could rocket at some stage. If you have the original edition using the laser technology then you’re definitely in for a payday or keepsake as a family heirloom. 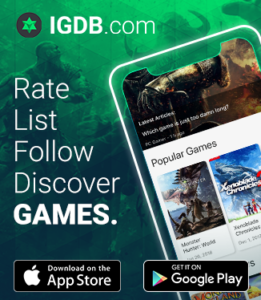 In terms of gameplay Time Gal will give quite some challenge to the gamer. I found that in some cases I practically had to press the event direction before the indicator suggested. You may remember from my Strahl review last year that I’m quite fond of games in this genre. Time Gal is no exception. Strahl running on the Japanese Sega Saturn benefits greatly from the 32-bit processor and is still a clear winner for me in this category. Dragon’s Lair may have set the initial standard but the difficulty was enough for me to lose interest in the very long term. Time Gal hits a really good balance. I find the lead character more engaging than Dirk the Daring and the overall game difficulty doesn’t put me off coming back for more when I do fail. Time Gal and cinematic movie adventure games in general won’t be for everyone. Essentially the game is boiled down to a series of quick time events. Something that has almost become a no go mechanic in recent years. Time Gal does showcase the technology of the era off very well though. Most gamers treat this genre as a bit of an oddity, yes it’s something you can do but it’s not something that the masses are likely to take in to their hearts as easily as a classic Street Fighter or Space Harrier. 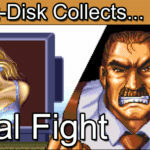 If you’re a collector with a passion for Japanese culture, the Sega CD and obscure heroines then I think that you’ll get a bit of a kick out of Time Gal. Go in to this one open minded then there’s really not much to dislike.As I leave you with some highlights you may just have found your new favourite Japanese heroine of gaming.